The Twinny Plus looks the same as the Twinny but with two rear wheels. The Twinny Plus three wheel tandem bike is ideal for enjoying a bike ride together. Getting on and off the Twinny Plus three wheel tandem bike can easily be done by the low step trough. Equipped with two rear wheels instead of one, the Twinny Plus trike provides more stability. Because of these two wheels it becomes more easy to get on and off of the bike when its standing still. There is more space between the front and the steering wheel of the person driving in the rear, so you do not sit too close together. 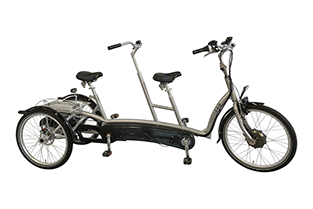 The three wheel tandem bike disengagement system are adjustable in such a way that you could choose to pedal alone, ‘switch off’ your co-driver, or choose to pedal together. You can use the optional switch-able free wheel to determine whether and how the passenger pedals. There are many options available with this bike, i.e. a divisible variety. With electrical power assistance cycling on this modern designed tandem bike is even easier.